The Classic exudes blue-collar class and although aggressively priced, Taylor will have to include more options to compete. Well thought-out and high quality overall design; good sounds. Despite the title of Taylor's SolidBody series, their first ever line of electric guitars, the Standard and Custom models both have substantial body cavities, imparting them with a certain 'hollow' tone. The Classic, however, is the only guitar in the series that is completely solid. The body contouring is complex. It's constructed from solid light ash, which is visible through the guitar's slightly translucent white finish. The back is curved subtly in both planes and there's a rib-cage contour. The edges have a slight chamfer all the way around, being most pronounced at the pointed (Florentine style) cutaway, which, to our eyes at least, would look better if it was rounded (as on the SolidBody Custom). The top is also slightly curved in both planes, though it is far from having a traditional arched top. In playing position the guitar looks much thinner than it is. Maximum depth is approximately 46mm in the body centre, although the rim on the bass side is nearer 30mm. But it's also tapered from bottom to top: 45mm by the bass strap button, around 35mm by the neck joint. It's of a good, solid weight, and strapped on it feels more conventional than the other, more hollow guitars in the series with no hint of imbalance. The neck is satin-finished maple with a conventional scarf joint for the black-faced headstock. Dimensions are quite mainstream (42.8mm at the nut, 53mm at the 12th; in depth we have 20.7mm at the first fret, 22.3mm at the 12th), and the neck- to-body joint, Taylor's T-Lock, is not only tight-fitting but very stable and all achieved with just a single Allen key bolt. The fingerboard is rosewood adorned with small, mother-of-pearl dot inlays, and is left unbound. Fretting is immaculate from a medium wire. The radius, for an electric, is quite flat at Taylor's standard 15inches (381mm); more classic brands use a smaller radius like Fender's 7.25 or 9.5inches, PRS's 10inches and Gibson's 12inches. More contemporary brands do use a flatter radius, so it certainly gives the guitar a more modern, less vintage feel. Speaking of feel, the scale length is 632mm (24.9inch), the same as the T5, close to PRS's 635mm (25inch) and a little longer than Gibson's nominal 628mm (24.75inch). The neck profile is again typically mainstream and very Taylor: a medium 'C' profile. The back-angled headstock also sticks with safe Taylor territory. Only the standard, and rather generic-looking, big button tuners let it down. They feel a little spongy in use although we rarely used them; this is one very stable guitar. At the other end of the string is a fantastic new Taylor bridge design, machined from acoustically resonant aluminium and all curved and contoured, giving a very sleek feel. The strings 'top mount' into the back of the individual 'shuttles' and emerge over a precise looking lip-like break point. Individual intonation can be set via a small Allen key bolt just by the string anchor point, and the important thing is that the whole saddle moves, ensuring the same distance from anchor to break point wherever it's set. There is no individual height adjustment and the curve of the saddles is set at 12inches - the same geometry as on all Taylor guitars. There are no visible screws. The bridge is actually inset into the top and held in place by a rear mounted metal plate which you can see, along with the height adjustment bolts, when you remove the back plate. This fixing firmly clamps the bridge to the body wood for, Taylor believes, maximum vibrational transfer. If the bridge design was a serious job, the pickups - again developed by Taylor - were equally time intensive and were apparently the start-point of this whole electric project. On the Classic these are Style 1 humbuckers with mini humbucking-like chromed covers. They sit in chromed metal rings, with no polepiece adjustment, just standard height adjustment. Under the covers, however, we have what look like dual-rail single-coil-sized humbuckers. They pass to a five-way lever switch that gives us, according to Taylor's David Hosler: "Position one, full neck pickup; position two is the inside coils of both pickups in parallel - we have a north and a south polarity so we're still humbucking. Position three is the full neck pickup and one coil of the bridge pickup. Position four is the two inside coils again but now in series and position five is the bridge humbucker. The least humbucking is position three." The control knobs, again chromed metal, mirror the vibe of the bridge design and even the side-mounted output jack is placed on an American football-shaped chromed metal plate. 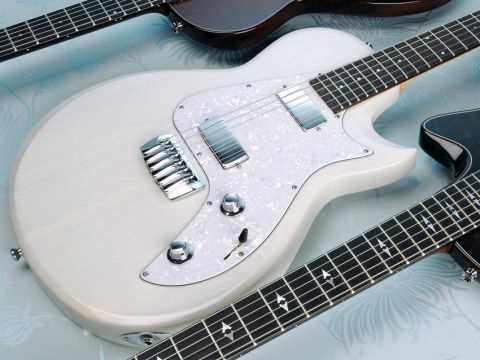 The pickups and control knobs are mounted on a white pearloid-faced scratchplate, and removing it reveals some very tidy electronics; the five-way switch is mounted on a metal plate and connects to a small PCB, which also holds the plug-in connectors for the pickups. There's a small five-milliamp fuse clearly visible too, which Taylor say "will fry instead of you" if you fall foul of dodgy or unearthed wiring. If the fuse goes, the guitar will still play, but may be a little noisy. The Classic generally speaks with quite a hot rod- like Fender-y tone. It's slightly bright and spanky overall, and with the Style 1 humbuckers there's plenty of bell-like chime to give the split- coil combinations (positions two, three and four) some real Fender- like flavour. Position two is the thinnest and most hollow, position three adds a little more fullness and position four is bigger but still with some hollowed texture. The full humbucking bridge sounds biting and gutsy but not over bright, the neck pickup is nicely contrasted - more SRV than Santana. The scale length feels 'right' here too, strangely feeling longer than it actually is, although the flat fingerboard radius creates a more modern feel after putting down our reference '69 Telecaster. On price alone the Classic is attractive, but with its hot-rod Tele-like spank and expanded sounds it should find fans in a diverse range of styles from mainstream pop, country and blues to more modern taut, wiry and punchy styles.